Ahead of Tuesday's parliamentary Brexit vote in the UK, the European Court of Justice will deliver its final ruling today on whether the UK can decide to halt Brexit. The case is being closely watched by those who favor a second referendum on UK's Brexit. It has been expedited due to the tight time frame as the UK Parliament is due to vote Tuesday on the withdrawal agreement. Prime Minister Theresa May, whose Conservative Party is deeply divided on Brexit, has faced an uphill battle to sell the deal to parliament. Britain is due to leave the EU on March 29, 2019. The FTSE 100 Index is set to open lower this morning tracking US and Asian markets lower. The economic events calendar has UK's industrial and manufacturing production and month GDP numbers at 0930 GMT. 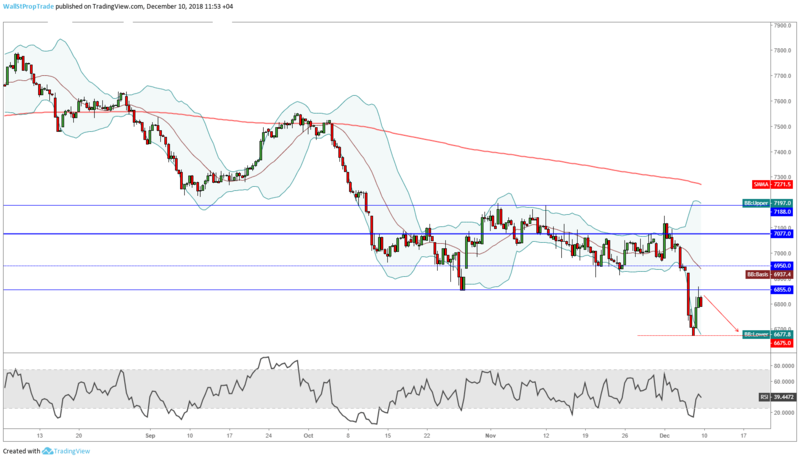 Unable to break through the key technical resistance level at 6855, the market closed below it after spiking up to 6868 earlier during the day. The failure to close above the resistance could increase that levels significance going forward. With another close below the lower bollinger band, prices are confirming their strong downward momentum in the short-term. A rally back into the bollinger band today however might signal a potential change in momentum that could lead to a correction back up towards key resistance levels at 6855 and 6950 in extension, though the trend is clearly bearish, showing an intact downtrend in the short, medium and long-term.